IHI Environmental, a Terracon Company (Terracon), has performed a variety of industrial hygiene and occupational safety services on more than 300 projects for the U.S. Army National Guard since 1999. These services have been conducted at more than 250 facilities throughout the western United States, Hawaii, and Guam. A majority of these projects have included industrial hygiene and occupational safety surveys that have been conducted in a variety of buildings and settings that include Army aviation support facilities, combined support maintenance shops, unit training equipment sites, field maintenance shops, and armories. The purpose of the surveys is to identify and measure potentially hazardous operations or working conditions; establish a baseline of workplace exposures; evaluate existing control and protective measures; provide recommendations for additional controls; and measure compliance with regulations established by the Occupational Safety and Health Administration (OSHA), The American National Standards Institute (ANSI), and the National Fire Protection Association (NFPA). A Terracon strategy that has proven successful with the Army National Guard has been to team a Certified Safety Professional (CSP) with a military background of 35 years and a Certified Industrial Hygienist (CIH) with 29 years of experience to work on these projects. During a recent visit to a helicopter maintenance facility, we addressed several helicopter mechanics’ concerns about entering the fuel cells of UH-60 Black Hawk helicopters to perform maintenance work. 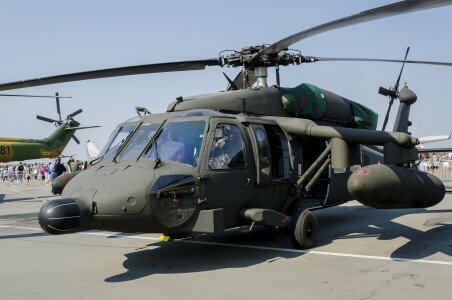 The UH-60 fuel cells are located in the tail boom of the helicopter, have a capacity of 180 gallons of fuel, and are large enough for a mechanic to enter. As such, the fuel cell is considered a “confined space” according to OSHA. In response, Terracon conducted a hazard assessment of the fuel cell maintenance operation, identified problems with the Standard Operating Procedure (SOP) for the work, and made recommendations for improving the safety of the operation and amending the SOP. While working on the confined space assignment, we visited another aircraft facility and observed that some models of UH-60 Black Hawk helicopters were equipped with high-power antennae used for relaying radio signals to orbiting satellites (SATCOM). Other helicopters, such as the CH-47 Chinook and UH-72 Lakota, were also equipped with tactical air navigation (TACAN) antennae. All three aircraft and other helicopters emit radio frequency (RF) radiation from the antennae. RF radiation is a form of “non-ionizing” radiation. This energy is not great enough to cause atoms in human tissue to ionize and potentially cause damage to DNA; however, exposure to excessive RF radiation can cause heating of body tissues in a manner similar to how a microwave oven heats food. The technical data and Army National Guard SOP for the communications equipment specified minimum hazard distances that personnel are required to maintain while the antennae are transmitting, but no measurements of RF exposure potential had ever been made at these facilities. In speaking with the helicopter mechanics and pilots, it became evident that there was concern among the troops that operation of the radios while on the ground could potentially result in hazardous energy exposures to ground personnel. In a proactive measure, we discussed the situation with the client contact and suggested testing for RF radiation. The client agreed, and Terracon made RF energy measurements around the aircraft at various distances while the antennae were transmitting. Based on our findings, we determined that the SOP for ground radio transmission needed to be amended to increase the hazard distances from aircraft to protect military personnel. At Terracon, delivering success does not mean just conducting services that we are contracted to perform – our occupational health and safety specialists also assess workplace settings and suggest proactive solutions for issues that they observe and that our clients might not be aware of.